Tesla Model S Burns the 2018 Ford Mustang GT: Look Ma, No Track Mode! 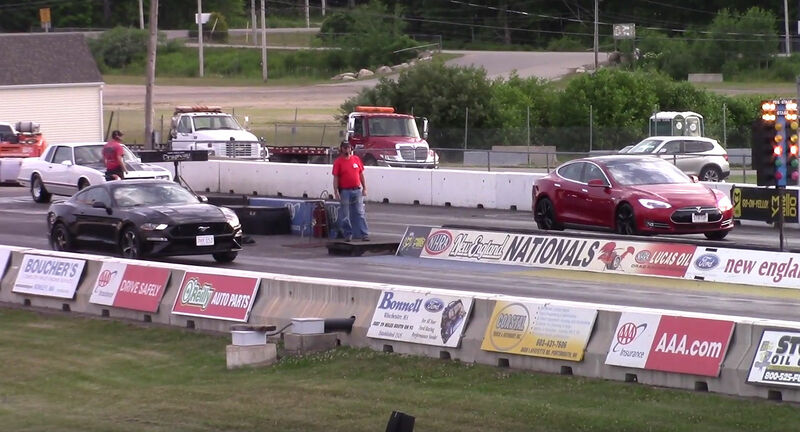 What happens when you pit a Model S P90D against a 2018 Ford Mustang GT in a 1/4-mile race? Unfortunately for Ford, the Tesla wins by a mile, figuratively speaking. To be precise, the Tesla beat the Ford by 11.56 seconds to 12.44 seconds, which is as good as a mile. To be fair, the Ford would have eventually caught up because it has a top speed of 157 mph, as you can see in the video below. The Model S P90D on Ludicrous Mode can only do 155 mph. But in a quarter-miler, the Model S will beat nearly any comparable ICE car every time. The race (shown below) highlights the instant torque sent to the wheels by the electric motors, which is why the Model S is able to pull our far ahead of the Mustang in the first couple of seconds. That’s a big advantage on the track, especially during the 1/4-mile run – which brings us to Track Mode, a new feature that’s still being beta-tested on the Model 3 Performance. According to Tesla CEO Elon Musk in a recent YouTube interview, Track Mode is essentially for expert users who want to tweak their car’s settings for the track. He didn’t add the fact that it’s also meant for people who don’t mind spending money on components that may wear out faster than usual when using Track Mode. This latest race pitting the slower sibling of the P100D is yet another nail in the coffin of ICE vehicles. Tesla has proven time and again that their cars are quicker to 60 mph even when punching above their weight. And they’re beasts on the 1/4-mile runs, too. That said, just like the Mustang would have eventually caught up with the Model S P90D, the Lamborghini was nearly there at the 1/4-mile point. The Model X P100D only bested it by 0.05 seconds. Nevertheless, it’s impressing to see the Tesla pull ahead at the start. WARNING: Lower your volume for this one. The Lamborghini is a screamer!